On April 5, 2008, Mike Metlay performed a live improvised soundscape for the audience of StillStream, an Internet Radio station featuring ambient and experimental electronic music. This piece, intended simply as a test run for a set of performances coming up later that month, quickly turned into something more -- as it progressed well past its initial time frame and swelled to nearly an hour of nonstop music, it defined the edges and corners of Metlay's musical canvas, setting up a framework of sounds and techniques within which he'd been working for years, ever since his self-imposed exile from solo music was broken with 2002's after silence. 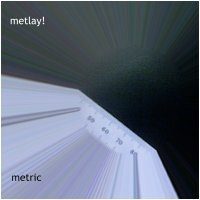 It became, in effect, an exemplary measurement -- what scientists call a "metric" -- for the style of improvised live ambient music that was instantly definable as Metlay!. Having staked out this territory successfully, Mike is moving forward, creating new timbres for his existing machines and exploring new tools and performance methods in his endless quest for exciting and meaningful music and sound. But as a defining moment and perhaps a dividing line between what was and what is, even as every Now separates the unreachable Past from the unknown Future, this piece stands proud on its own, live-on-the-air imperfections and all. I must have overlooked and under-appreciated this album when I first listened to it, but now that I'm re-listening to the vast archives of Earth Mantra and experiencing the music on a more conscious level, I must admit this is one powerful release! I love the pulsating sequences and the melodic pads from 25:00 onwards in particular.